US President Barack Obama vowed on Sunday (15 November) to step up efforts to eliminate Islamic State and prevent more attacks like those in Paris, while urging Russia’s Vladimir Putin to focus on combating the jihadist group in Syria. The two-day summit brings Obama and fellow world leaders just 500 km (310 miles) from Syria, whose 4-1/2-year conflict has transformed Islamic State into a global security threat and spawned Europe’s largest migration flows since World War Two. Obama described Friday’s killing of more than 120 people in Paris, claimed by the radical Sunni militant group, as an attack on the civilised world and said the United States would work with France to hunt down those responsible. “The skies have been darkened by the horrific attacks that took place in Paris just a day and a half ago,” Obama said. “We will redouble our efforts, working with other members of the coalition, to bring about a peaceful transition in Syria and to eliminate Daesh as a force that can create so much pain and suffering for people in Paris, in Ankara, and in other parts of the globe,” he said, using the Arabic acronym for Islamic State. US-led efforts to combat Islamic State were complicated when Russia joined the conflict a month and a half ago, targeting what the West says are mainly areas where foreign-backed fighters are battling Assad, Moscow’s ally, rather than Islamic State. Obama huddled with Putin during a working lunch, and the two agreed on the need for a Syrian-led transition including UN-mediated talks, the White House official stated. 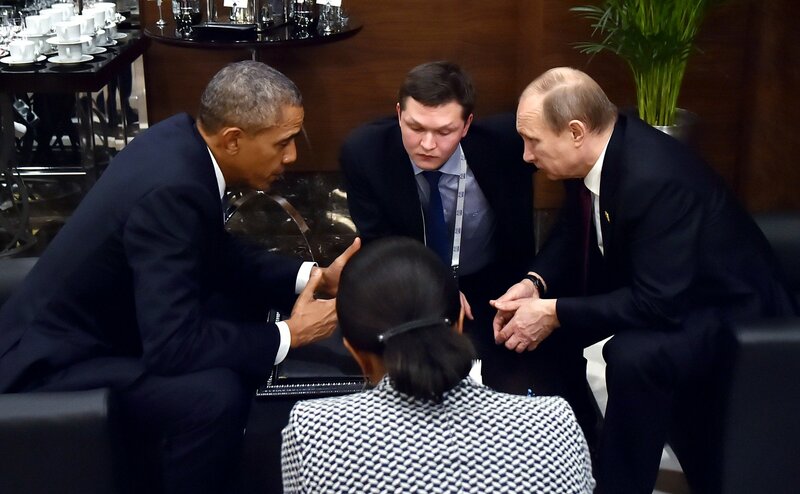 Putin and Obama talked “extensively”, Russian news agencies cited top Kremlin foreign policy adviser Yuri Ushakov as saying. Their meeting builds on progress in Vienna, where foreign ministers on Saturday outlined a plan for a political process in Syria leading to elections within two years, although differences over Assad’s role remain. Washington already expects France to retaliate by taking on a larger role in the US-led coalition’s bombing campaign against Islamic State (ISIL). UN Secretary-General Ban Ki-moon said he welcomed the renewed sense of urgency to find a solution to the war in Syria after the Paris attacks, adding the world had a “rare moment” of diplomatic opportunity to end the violence. Obama wants to coax other European and Middle Eastern countries into more tangible steps to show their military commitment. He met Saudi Arabia’s King Salman, discussing the need to support the moderate Syrian opposition and the Iraqi government in the fight against Islamic State. Obama said he also discussed in a meeting with Turkish President Recep Tayyip Erdo?an coordinating efforts to fortify the border with Syria, which Islamic State has used to smuggle supplies and foreign fighters. The coordinated attacks by gunmen and suicide bombers in Paris on Friday put Obama and other leaders of the world’s major economies under increased pressure to find common cause. Europe and Turkey, the most heavily hit by the crisis, had been pushing for the G20 to recognise the issue as a global problem and help to deal with it financially, despite opposition from China, India and Russia. A million migrants from the Middle East and Africa are expected to come to Europe this year alone. According to a separate draft statement, they also agreed to step up border controls and aviation security in the wake of the Paris attacks, which they condemned as “heinous”. Donald Tusk, the President of the European Council, said in Antalya that he would appeal to every one of the G20 leaders to concentrate their actions on Daesh. “They are the real enemy of the free world, not the moderate Syrian opposition,”, he said. “We are also in the midst of a refugee crisis with millions of people running from their homes, escaping terrorists and brutal regimes. Today it is high time to recognise that it is a global crisis, which requires a global solution. We therefore call on the G20 leaders to develop a coordinated response, both to the short term needs and the root causes. We do not ask our partners to do more than Europe does but we ask the international community not to do less. All G20 countries should share the responsibilities associated with this crisis. Solidarity should be at the core of our decisions,” Tusk stated. Commission President Jean-Claude Juncker said at the press conference in Antalya that the terrorist reportedly carrying a Syrian passport and having been registered as asylum-seeker is “a migrant who has abused the procedures”. “Let’s not mix up the authors of the criminal acts in Paris with the asylum seekers, with the migrants who have good reasons to knock at our doors,” he said. Regarding the talks with Turkey on stemming the refugee flows, Juncker said a meeting with Turkish President Recep Tayyip Erdo?an will take place today, and that President Tusk will convene an extra summit between Turkey and the 28 member states very soon. “This will be the very moment when these negotiations will be brought to an end,” Juncker said.